The Norwalk center is about 2 miles northwest of Cerritos Center for Performing Arts and 5 miles northeast of Purple Heart Veterans Rehabilitation. Hotel Saddleback : 12500 Firestone Blvd. Days Inn Whittier Los Angeles : 14330 Telegraph Rd. Rates shown are nightly rates before taxes and do not necessarily reflect all Norwalk, CA discounts available. The chart reflects the cheapest Norwalk hotel for each day and each star rating category. One of the most densely-populated cities in California, Norwalk is home to over 107,000 people. It is situated 17 miles southeast of downtown LA in the Greater Los Angeles area. Norwalk was first home to the Shoshonean tribe before settlers moved in during the late 1760s and built missions. The area flourished under Spanish rule, and by 1873, railroads came to the area. The name Norwalk was officially recorded in 1874, and the Norwalk Station encouraged visitors to travel to the mostly undeveloped land during the late 1800s. By the early 19th century, Norwalk was a flourishing dairy center and home to ample sugar beet farms. The Hispanic population grew after the 1950s as the community became more residential. Today, Norwalk is a member of the Gateway Cities Council of Governments and features an array of shopping, dining, and educational opportunities for both residents and visitors. Whatever your reasons for visiting Norwalk, it's important to find the right hotel that allows you to enjoy everything the Greater Los Angeles area has to offer. The best times to visit Norwalk is in the shoulder seasons from March to May and again from September through November. There are fewer crowds to contend with, resulting in lower hotel prices, and the air is clearer and more breathable. Since temperatures range from the low 50s to the low 80s, exploring the city on foot is much more enjoyable than in the summer heat. Spring events happening around Norwalk include the Los Angeles Marathon, the Los Angeles Times Festival of Books, Fiesta Broadway, and the Jazz Reggae Festival. In the fall season, you can experience the Emmy Awards, the LA County Fair, the Abbot Kinney Festival, Dia de los Muertos Festival, and the Hollywood Christmas Parade. Average temperatures heat up to the mid-80s during the summer, which can feel oppressive when coupled with increased smog levels. Oceanside neighborhoods are also more crowded during the summer, which could cause you to seek respite indoors. If you do visit during peak tourist season, however, you'll be rewarded with key events like LA Pride, the LA Film Festival, Outfest, the DTLA Film Festival, and Nisei Week Japanese Festival. Discover the best deals in the Greater Los Angeles area during the winter months. Temperatures aren't as cold as they in other parts of the country, but you will need to pack an umbrella and rain jacket. Best of all, hotel rates and airfare are at their lowest during the winter season, allowing you to visit the LA Art Show, Chinese New Year and Golden Dragon Parade, and multiple red-carpet awards on a tighter budget. 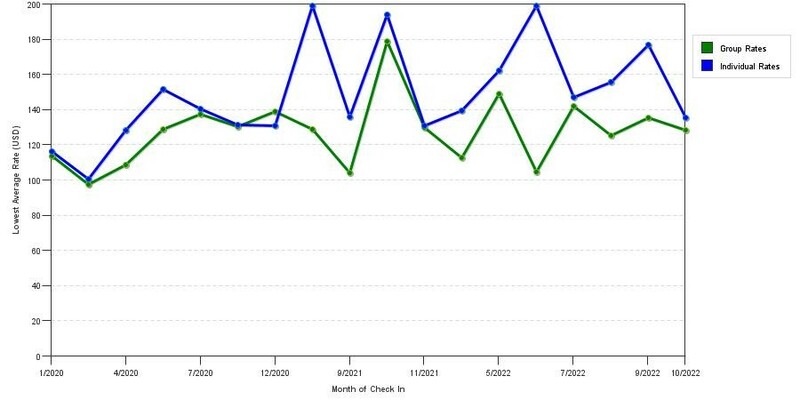 Below we've posted 3 graphs demonstrating mean nightly cost patterns by star rating class in Norwalk, CA. 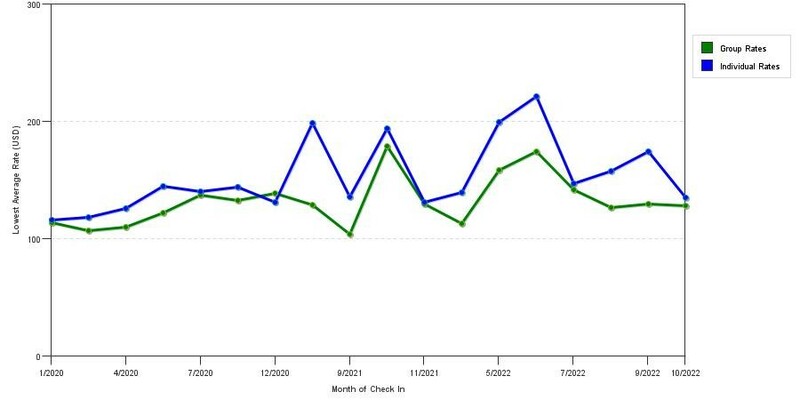 You can use these charts to evaluate the most cost effective time period to book in Norwalk for your upcoming travels. If you'd prefer more upscale accommodations in Norwalk, you're in luck. DoubleTree by Hilton Los Angeles - Norwalk is a friendly, welcoming property with a chic bar and lounge area that's perfect for socializing. Business travelers can take advantage of the on-site business center with audio/visual equipment rental, printing service, meeting rooms, and phone service. All travelers will love the 24-hour pantry market for a grab-and-go snack, baggage storage area, gift shop, laundry service, outdoor pool, whirlpool, and signature chocolate chip cookie upon arrival. Sheraton Cerritos Hotel is a smoke-free, pet-friendly property with 203 guest rooms, 21 suites, and Wi-Fi internet access throughout. The hotel offers a fitness center, pool, Starbucks coffee, lounge, and on-site restaurant, including a beautiful patio with multi-colored umbrellas and lush foliage. Parking is free, but you can also take advantage of the airport shuttle service for just $20. Room amenities include video rentals, ironing facilities, hair dryers, signature bedding, coffee makers, room service, and flat-screen TVs. If you don't mind staying a little farther from Norwalk, check into the Embassy Suites by Hilton Los Angeles Downey. This downtown hotel features a posh indoor pool, fitness facilities, an evening reception, a free cooked-to-order breakfast, event space, and a popular on-site restaurant with a daily happy hour. Rooms and suites are beautifully decorated with modern touches and are fully equipped with flat-screen TVs, microwaves, refrigerators, and workspaces. Book a city-view suite to enjoy some of the area's best views of the Hollywood sign. Finding an affordable hotel in Norwalk is easier than you might think. Norwalk Inn & Suites is a budget-friendly accommodation with 40 air-conditioned guestrooms. Each room features a microwave, mini-fridge, cable TV, work desks, free Wi-Fi access, and complimentary bathroom toiletries. The hotel also features a 24-hour front desk, free self-parking, and laundry facilities. It isn't fancy, and some of the rooms could use some updating, but the Norwalk Inn & Suites is a great choice for travelers on a tight budget. Motel 6 Norwalk is a trusted budget brand located on the Imperial Highway. It offers pet-friendly and smoking rooms, in-room refrigerators, microwaves, rollaway beds on request, and exterior corridors. Free Wi-Fi and cable are provided in every room, but parking is limited, which is something to keep in mind if you plan on driving. Rodeway Inn Artesia is a solid roadside hotel close to the Long Beach Airport and Aquarium of the Pacific. Guest amenities include free Wi-Fi access, an outdoor pool, complimentary coffee, free breakfast, and copy, print, and fax services for business travelers. Every room includes a pillowtop mattress, hair dryer, television, and refrigerator, while some offer sofa sleepers and additional amenities. If you qualify for a special rate, you can save even more money on your trip to Norwalk. For example, seniors can save up to 20 percent off area hotels such as La Quinta Inn & Suites Buena Park. This affordable hotel offers an on-site fitness center, complimentary breakfast, an outdoor pool, and seven floors of guest rooms. Each room is decorated in tasteful wood furnishings with colorful accents. Enjoy a flat-screen TV, separate workspace, lounge chair, and ample drawer space for your belongings. Other hotels offering a senior discount include Howard Johnson Buena Park, Americas Best Value Inn Pico Rivera/East Los Angeles, and DoubleTree by Hilton Whittier Los Angeles. Government employees, military families, and AAA members can also qualify for money-saving rates. Simply book the special rate at hotels like the Holiday Inn Buena Park & Conference Center and show proof of your eligibility at check-in. Norwalk has many mid-range hotels that give you an unbeatable value for your dollar. Guesthouse Hotel Norwalk is an affordable three-star property boasting a lovely landscape with flowers and palm trees. The non-smoking hotel offers 227 guest rooms, a business center, coin-operated laundry facilities, a heated outdoor pool, meeting rooms, and an on-site restaurant. Every guest room includes a hair dryer, coffee maker, iron and ironing board, alarm clock radio, and free Wi-Fi. Best Western Norwalk Inn boasts a free breakfast, business center, outdoor pool, outdoor hot tub, and free Wi-Fi. Guest rooms include comfortable linens, flat-screen TVs, separate seating areas, work desks, and DirectTV with movie and sports channels. Suites feature in-room sofas, king-size beds, mini-fridges, microwaves, and additional space. Wherever you stay in the Greater Los Angeles area, you'll have easy access to numerous attractions. Norwalk is situated close to Turnbull Canyon, a former landfill site that now features a four-mile loop trail close to Whittier, California. Trails are open from sunrise to sunset and provide the perfect location for hikers and bikers to complete a nice workout in nature. It wouldn't be a trip to LA without a stop at the Hollywood Walk of Fame. These famous, star-studded sidewalks comprise 15 blocks of Hollywood Boulevard and part of Vine Street. Each star features the name of the entertainment industry's greats, including actors, directors, musical acts, producers, and more. As one of the city's most popular tourist destinations, the Hollywood Walk of Fame attracts a reported 10 million visitors per year. If you're planning a trip to Norwalk with the whole family, consider spending a day or two at Disneyland. Walt Disney's magical kingdom first opened in 1955 and features two theme parks including Disneyland and Disney California Adventure. Experience world-famous thrill rides, live music shows, fireworks, and delectable dining options in one of the most magical places on earth. If you don't mind the drive, be sure to head to the Santa Monica Pier, which is located 30 miles from Norwalk. The iconic landmark is more than 100 years old and is the perfect place to view the Pacific Ocean. Ride the historic carousel, play in the arcade, and take a free historical walking tour while you're at it. Exploring Norwalk and the Greater Los Angeles area is a fun challenge you won't back away from. Whether you're looking for budget-friendly roadside accommodations or a more upscale hotel, you can find the perfect option near Norwalk that meets your needs and budget.